Can she sing? Oh yeah! Can he play? You betcha!! Katie & Feff are the acoustic sensation that your ears have been begging you for. With over 20 years industry experience between them Katie & Feff are certainly not new to the world of entertainment. The Katie & Feff show was born when these two combined forces with the same passion to create an act that was purely made of "real" music and instrumentation. You wont catch them playing with any artificial sounds, Katie & Feff are 100% organic, real, easy listening, toe tapping & party entertainment. If you want to get up and dance they have the groove to make you move. If you would prefer a quiet beer and some smooth acoustic tunes to finish of your Sunday afternoon they have you covered! Katie & Feff are as diverse and eclectic as the music they play. 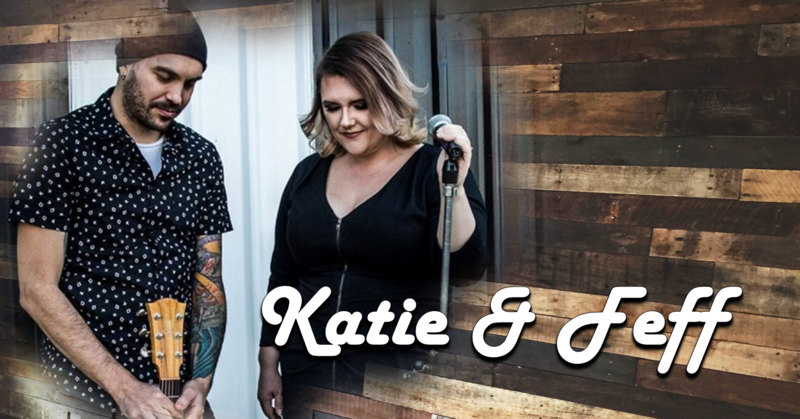 With a combination of male and female vocals coupled with warm acoustic guitar, stomp and percussion Katie & Feff are an act not to be missed.